In Chinese mythology, Chi You (蚩尤) is a war deity who fought the Yellow Emperor. For Hmong, Chi You is a sagacious mythical king. Chi You, “Xib Ywj” sounds like “Txiv Yawg” which can be used as a title or more literally “Great-Grandfather” in Hmong. Chi You is also the god of rain, and a descendant of Shennong, the inventor of agriculture. 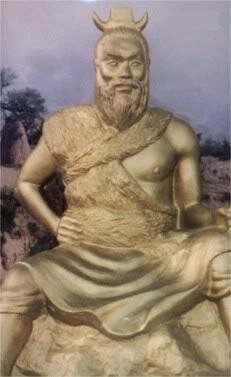 Along with Yan Di and Huang Di, Chi You is a deity in Miao mythology, Chi You was the mythical leader of the Miao people (Hmong nationalists claim this), king of Jiuli, and once a follower of Yan Di. When Huang Di subdued Yan Di, Chi You was weary of the suppression and conspired with Yan Liang, another deity. Soon, Huang Di and Chi You clashed in the Battle of Zhuolu. According to Chinese legends, after Huang Di had subdued Yan Di, Chi You and his people invaded the lands that belonged to Yan Di because Yan Di’s clan was growing at an alarming rate and posed a threat to Chi You. Yan Di’s clan then sought assistance from the Yellow Emperor (Huang Di) and both fought against Chi You at Zhuolu plains. Both sides used magical powers, but Chi You had the advantage because his troops were armed with forged swords and halberds. Using his power (perhaps a mythological explanation of meteorology used in warfare), Chi You covered the battle field in thick fog. Only with the help of a magical compass chariot (South Pointing Chariot) could Huang Di’s troops could find their way through the mist. He also used his daughter Nü Ba, the Goddess of Drought, to harm Chi You’s troops. Later on, Chi You suffered more defeats and was captured. Only Yinglong, the winged dragon, being a brave servant of Huang Di, dared to slay him. Chi You’s chains were transformed into acorn trees, while Yinglong was cursed to remain on earth forever. According to Chinese legend, the people under Chiyou (蚩尤 Chīyoú) were defeated at Zhuolu (涿鹿 Zhuōlù, a defunct prefecture on the border of today provinces of Hebei and Liaoning) by the military unification of Huang Di (黃帝 Huángdì) and Yandi, leaders of the Huaxia (華夏 Huáxià) tribe as they struggled for supremacy of the Yellow River valley. The South Pointing Chariot the crucial reason of Huaxia’s victory. The battle, believed to have taken place in the 27th century BC, was fought under heavy fog. However, due to Huaxia’s leader Huang Di inventing the South Pointing Chariot at that battle, the Huaxia were able to negate the effects of the fog. After the loss, the original tribe split into two smaller splinter tribes, the Miao (Hmong) and the Li (黎 lí). The Miao migrated southwest and Li southeast as the Huaxia race, now known as Han Chinese race, expanded northwards. During the course of Chinese history, they were regarded as “barbarians” by the increasingly technologically and culturally advanced Han Chinese. Some fragments of the races were assimilated into the Chinese during Zhou Dynasty. Yet, in other versions, the people of Jiuli fragmented in 3 different directions. It is said Chiyou had 3 sons, and after the fall of Jiuli, his oldest son led some people south, his middle son led some people north, and his youngest son remained in Zhuolu and assimilated into the Huaxia culture. Those who were led to the south established the San-Miao nation. Perhaps due to this splitting into multiple groups, many Far Eastern people regard Chiyou as their ancestors, and by the same token, many question the ethnicity of Chiyou as exclusively Hmong or otherwise. In some circles of thought, the Koreans also regard Chiyou as an ethnic ancestor. Chiyou is also regarded as one of China’s forefathers alongside the ethnic Han ancestors, Huangdi and Yandi. “Huang Di ordered his men to have Chi You beheaded… seeing that Chiyou’s head was separated from his body, later sages had his image engraved on sacrificial vessels as a warning to those that would covet power and wealth.